In the past, home and business owners along the creek that comes from Mantua Reservoir, near Brigham City, Utah, had very little warning concerning high-water flows coming down the creek. 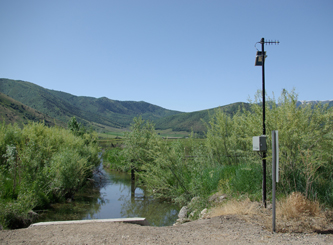 To remedy this, Brigham City officials contracted with Intermountain Environmental, Inc., (IEI) to design and install a hybrid flood warning system for the watershed and water-delivery channel adjacent to Mantua Reservoir. The system would notify emergency personnel of the possibility of flooding or dangerous water levels in the creek. In March of 2008, IEI installed three measurement stations based on CR800 dataloggers and RF450 spread-spectrum radios from Campbell Scientific. First, IEI installed a station to monitor the water level in a concrete culvert near the inlet of the reservoir. The second station includes a pressure transducer installed in the reservoir near the outlet (spillway) and a rain gage installed near the outlet. The third station is located down the canyon, with the pressure transducer in a stilling well at a Parshall flume in the creek that runs to Brigham City. Finally, IEI installed a base station with a CR800, RF450, and COM310 voice modem in a nearby city building. The base station requests the water-level, flow, or rain data from each station every minute. If an alarm condition has been met, such as high reservoir level or high flow rate in the creek, the CR800 initiates a call through the COM310 and gives the emergency personnel a customized voice response based on the associated alarm. Brigham City has designated certain customizable water levels, flows, and amounts of rain as alarm conditions. Also, the emergency personnel have the option to call the base station at any time to listen to a voice report of all system data. Brigham City will soon have an internal website, created using Campbell's LoggerNet and RTMCPro software, that will display all the current data throughout the network of stations. The network can also send emails or SMS text messages. Intermountain Environmental builds hybrid warning system for Brigham City.